There has been much debate in the UK press recently about the meaning and future of the ‘secular’ but such discussions have often produced more heat than light, particularly for some religious communities who feel ever more threatened by a changing culture. A large part of this anxiety is generated by thorny questions concerning what ‘the secular’ is and how do we know if we’re really part of it. Is it simply about widespread disbelief in God (or a Higher Power) or something more? And how is this non/belief linked to the ideology known as ‘secularism’? Some reactive religious communities continue to believe that if only they can define and ‘unmask’ the secular, they can affectively police the commitment of their members, sealing fragile souls inside a pious bubble, protected from a hostile world. But as I go on to suggest, it is not that simple. There might be paths beyond the secular, but these tracks may not lie where people think they do. Being ‘religious’ in a secular context might require a great act of imagination both strange and wonderful. Just insisting on some list of dry traditional values may not be enough. In this post, I want to consider what ‘the secular’ might be by looking closely at the thought of the Medieval mystic, physician, and musician, Hildegard of Bingen (1098 –1179). By filtering her richly complex theology through the work of philosopher Charles Taylor, I want to shed some fresh light on what is or isn’t secular. I want to suggest that full secularity is not merely about one’s nonalignment to religious beliefs or practices, but the rejection of a symbolic and analogical approach to the world. Thus, in the enchanted world of Christendom, it was entirely rational to affirm the actions of spirits, the intercession of saints and the power of relics since subjectivity was not confined to human agents. What are the distinctive features of an enchanted paradigm? A useful way into this question is to consider George Lindbeck’s ‘cultural-linguistic’ treatment of religious life. A key insight in Lindbeck’s analysis is the claim that what Taylor calls enchantment, is underlined by a shared narrative. The immersion in an enchanted world is made possible by the participation of communities in a common story which structure the way they speak and act. This narrative structure to life is underlined by Taylor’s claim that meaning is not just in the mind, but is constantly leaking out into the world. In this model, our stories intersect with events, just as events intersect with stories. When the sun rises high in the sky in summer, this fire carries out God’s vengeance by the fire-causing lightning; when the sun descends in winter, the judgement fire indicates condemnation and punishment by ice, cold and hail. For every sin, will be punished according to its nature, by fire, cold and other afflictions. Every stone contains fire and moisture. The devil abhors, detests, and disdains precious stones. That is because he remembers that their beauty was manifest on him before he fell from the glory God had given him, and because some precious stones are engendered from fire, in which he receives his punishment. By the will of God, the devil was vanquished by the fire into which he fell, just as he is vanquished by the fire of the Holy Spirit when human beings are snatched from his jaws by the first breath of the Holy Spirit. [Both] of them- sun and moon- then serve humankind in accord with the divine order, bringing us either health or illness according to the mix of atmosphere and aura …. If the moon is waxing, the brain and blood of human beings are also increased. If the moon is waning, the substances of the blood and brain in human beings also diminish. 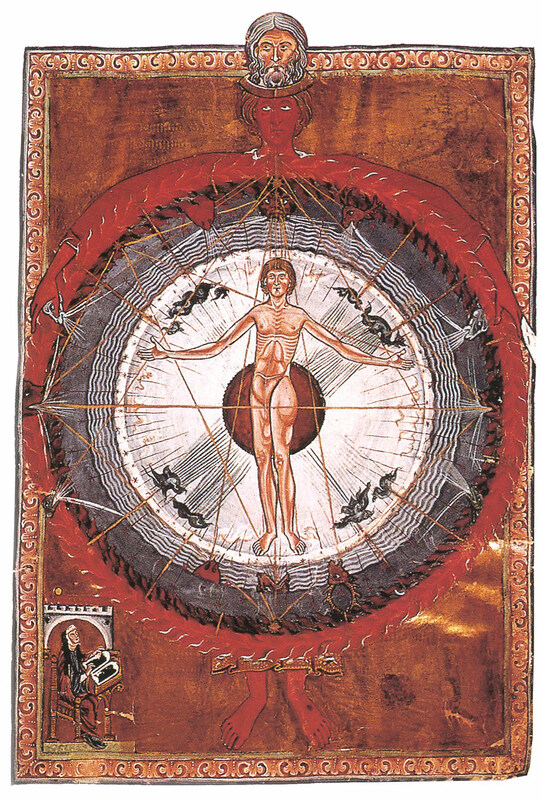 Yet such astrological vision of medicine is never a declaration of fatalism for the Catholic Hildegard, but an expression of the hermetic principle supera et infera eadem sunt (as above so below). Here medicine is concerned not merely with physical health (much less predicting the future) but the restoration of various kinds of social and sacred balance. Thus, as the anthropologist W. H. R. Rivers helpfully observes in his now famous study Medicine, Magic, and Religion, in many tribal societies disease was regarded as the result of an ‘infraction of totemic ordinances’ while cure was sort by the restoration of social relationship, through the confession of the malevolent party or else through ‘curative rites connected with taboos.’ Pre-modern pre-secular Western medicine in this sense was a technology not only concerned with the causation between disease and cure, but touched upon the restoration of numerous hidden relations in the world and the body (one’s ancestors, one’s community, and one’s inner character). In agreement with this symbolic logic, when sins darken the human soul, says Hildegard, this state finds outward expression in the disappearing moon ‘at its waning.’ Likewise, when human beings persevere in righteousness, this is made externally manifest in the light of the sun. In this way, Hildegard sees humanity as possessed with the special task of disclosing the rule of God to his creatures, a link between earth and heaven. The same human being who is confirmed and blessed through the enactment of the Eucharist is meant to set as co-judge with God, sitting in the vacated place of fallen angels. Yet because of humanity’s primordial act of sin (which Hildegard identified with a blackening sickness) people run after the lure of the magic arts. Instead of acting in partnership with God, our fallen species seek to imitate the devil by using creation for selfish own ends. Sin in this context is about a refusal of human beings to treat the creation humbly as a tutor of the self, but rather treat it as a means to and end, devoid of holy intent. What does this scheme tell us about the contrast between the sacred and secular? In her rich description of Adam and Eve before the fall, Hildegard tells us that all the elements of creation existed in a state of equanimity, serving human interests. When the primordial couple were expelled from Paradise, the art of medicine continued to provide a portal to this original state of harmony. Unlike the disordered hubris of the sorcerer, the art of the physician is modelled God’s desire for a redeemed creation. While magic relies on the destruction of preordained relationships, medicine is concerned with their restoration. To use modern philosophical jargon we might say that the sacred vision of Hildegard is holistic/ecological, while the vision of the magician is positively Baconian. Yet by employing such an oppositional rubric, one should not suppose that straightforwardly casual explanations are entirely absent from the enchanted world of Hildegard’s physic. As Rivers reminds us, many magical and religious practices encode accounts of physical causation, just as otherwise non-magical practices can take on a religious or magical significance. For her part, Hildegard is attentive to matters of organic function as her fascination with the workings of the heart and liver aptly demonstrate. Enchantment in this sense does not imply what the sceptical modern might regard as an anti-reality principle (the refusal to accept obvious causation) rather it concerns the imaginative apparatus through all causation should be understood. Hildegard did not refuse obvious causes and effects in favour of purely arcane reasoning. The stance suggested by her enchanted medicine is altogether subtler. The position being reached for is that matters of structure and function are inherently bound up with subjectivity, with experiences and judgements of spiritual status. ‘Sin’ is bound to illness not because of an abject refusal to accept that the human organism has a structure which obeys certain regular laws , but rather because such an organism cannot be fully understood without the Church’s sacred story. A modern parallel can be seen in example of a Reiki therapist, who, while acknowledging the effectiveness of antiviral drugs and MRI machines believes that there is more to health than a simple mechanistic account allows. In this way, we might say that secularity emerges not when we cease to tell the story, but when we separate matters of structure and function from that story. Thus, a religious congregation can be justly called functionally secular if the majority of the congregants are pure followers of sacred words/stories, but have no expectation that these stories will manifest in real-time (only in the deepest recesses of the soul). Such a stripped down personalised Protestant religiosity (whether it in fact calls itself Catholic or Protestant) has stripped religious symbols of active power, contracting out their real-world functions to medicine, private prayer or professional psychology. This religiously inspired state of decay is probably most advanced in heavily policed congregations where believers are taught to dismiss dreams, visions, premonitions, healing and the low-level telepathy of prayer, as ‘New Age nonsense’. Here such intense fundamentalism obscures a deep spiritual hollowness, as key religious claims about experience are separated from the real quandaries and deep needs of human life. For humans to stay religious our longings for the holy must in turn generate answers to the perennial issues of life and death. Once they cease to do this, the religious faculty becomes something of a vestigial organ. The symbolic forms remain, but the key to incorporating them into life has been lost. The great irony in this context is that the New Age astrologer or healer (condemned as sinful by committed purists) has a better intuitive grasp of what matters in the sacred life because s/he is able to see the invisible in the visible, unlike his religious yet highly secular detractors. Is there any way back into this sacred view of life? If Taylor is right, there is no way of putting this secular consciousness back in the bottle, even if we wanted to. Our very awareness of the possibility of a completely godless world means that the spell of the premodern is forever broken. We can’t simply wish our way into the world of Hildegard, no matter how much we say “I believe”. But for those who seek new depth in their religious traditions, there may be a way to enter the postsecular- a realm in which we discover the hidden linkages between stories and selves, symbols, and souls. This is the lynch-pin of Jung’s Analytical psychology, but it is also at the heart of Charismatic and Pentecostal movements that attempt to see their religious worlds through the activity of the Spirit, communicated in their holy stories. Once we break the embargo on linking our inner and outward worlds (Jung’s famed notion of synchronicity) we can begin to capture our sense of the sacred in a world made secular. But for many this process is only a vague possibility in a societies which are becoming increasingly alienated from holy ways of seeing. If this blog post is even half right, the danger for religious traditions in the modern world is not sacred forms being swamped by militant anti-belief, but rather, the prospect that in the very near future, the symbols and assumptions that tie together once influential religious narratives (particularly in the West) will become increasingly unintelligible or fragmented. What effect this will have on the course of our civilization, if left uncorrected, is anyone’s guess. Taylor, A Secular Age, (London: Harvard University Press, 2007), p. 12. Taylor, A Secular Age, (London: Harvard University Press, 2007), p. 13. Taylor, A Secular Age, p. 35. Taylor, A Secular Age, p. 32. 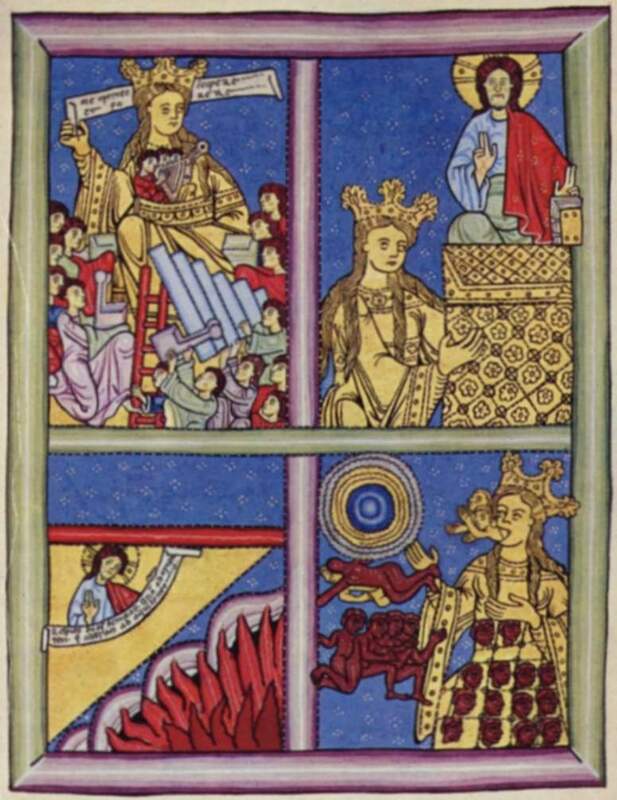 Hildegard of Bingen, Book of Divine Works with Letters and Songs, ed. Matthew Fox, (Santa Fe, Bear & Company, 1987), p. 27. Hildegard, Book of Divine Works), p.
 Hildegard, Book of Divine Works, ibid. Rivers, Medicine, Magic, and Religion, p. 35. Thanks for this Ben. There’s lots to process here. How I long to live in an enchanted cosmos! I’m in the middle of writing an essay on Lindbeck for my MA, and I am all up in Lindbeck’s gig.